We’d love your help. Let us know what’s wrong with this preview of Damaged Angels by Bonnie Buxton. To ask other readers questions about Damaged Angels, please sign up. When Bonnie Buxton adopted Collette she had no idea what a life of struggles she had found. Collette always struggled in school, had weird mood swings, lied, stole, and even threatened to take her sister’s life with a knife. Going to doctors was useless as they blamed her parenting, even when she suspected what it was they still told her she was wrong. Finally, many years too late, Collette was diagnosed with Fetal Alcohol Syndrome Disorder (FASD). This is her story. I loved the first hundred pages or so, it was a touching story of a family trying to make it through all odds. Having worked in group homes I have seen the effects of FASD, and understand how difficult it can be to deal with them. The family is wonderful and this couple must be patted on the back for having gotten through it with some amount of sanity. That being said this book kind of tanked off in interest in the last half. It started to focus on many different people’s stories of dealing with FASD and it got to be too difficult to focus or keep track of who was who. She also gave a lot of information, which got to be kind of tedious. If the author had focused on a few stories and gave half the information it would have been much more interesting. Overall it was not a terrible book, and if you deal with FASD children you might be interesting in reading the book. For any parent who has adopted, fostered or mentored a child of the system....or thought "just one glass of wine a day could be ok" - this book put it into perspective for us and helped change our style of parenting. If you were to look at the kiddos and me out in a store you might think "That woman doesnt know how to control her children...." Little do you know the how damaged their brains are....because they LOOK normal. 5 kids born to two different mothers who heinously abused multiple drugs a For any parent who has adopted, fostered or mentored a child of the system....or thought "just one glass of wine a day could be ok" - this book put it into perspective for us and helped change our style of parenting. As an adoptive parent with a child who has FAE - confirmed only after adoption and after a few years in which everyone refused to accept that he had 'issues' - I believe this book should be mandatory reading for any potential adoptive parent. It should also be required reading for any woman who believes it's safe to consume alcohol - in any amount - while pregnant. There are so many misconceptions about alcohol consumption during pregnancy. There are many more misconceptions about FAE and how it As an adoptive parent with a child who has FAE - confirmed only after adoption and after a few years in which everyone refused to accept that he had 'issues' - I believe this book should be mandatory reading for any potential adoptive parent. It should also be required reading for any woman who believes it's safe to consume alcohol - in any amount - while pregnant. There are so many misconceptions about alcohol consumption during pregnancy. There are many more misconceptions about FAE and how it impacts on children and the adults they become later; there is so much that can be done to help children with FAE, but only if they're properly diagnosed. A well written, well-researched book. Engaging personal stories mixed with useful facts, supports and resources. Some of it is heartbreakingly sad, some of it is very enlightening. You may well find yourself thinking, "oh, that explains ______'s kid so well!" If you ever hear a pregnant (or planning pregnancy) woman say "oh, a couple of drinks now and then don't hurt" or "I'm a very moderate drinker" or (gods forbid, the alcohol companies personal fave) "a glass of wine every day is good for you" A well written, well-researched book. Engaging personal stories mixed with useful facts, supports and resources. Some of it is heartbreakingly sad, some of it is very enlightening. You may well find yourself thinking, "oh, that explains ______'s kid so well!" this is a great book for anyone who is thinking of adopting an FAS child or wanting to know more about FAS. What i like most about this book is that there are canadian stats in it. It is difficult to use positive words to describe a book that covers such a sad and tragic topic. But this was very good and necessary read, especially because it was during a time when we were awaiting an answer from CPS to find out if we would be adopting a little girl with FAS. It truly was a powerful and insightful book that was most helpful in educating myself more on this. It is a must read for any one in the foster/adoption/education/ circle of things. This book was incredible. I think that anyone who works with people--kids or adults--should read this book. Nay, all should read this book because it dispells a lot of myths about alcohol and pregnancy. For me, while reading this book, I was immediately able to think of students I have/have had who might have been undiagnosed. I really enjoyed reading the stories of these brave families--the only thing I wish it had more of was information about interventions. This was a continued education requirement read full of personal insight about parenting Fetal Alcohol Syndrome disabled children. 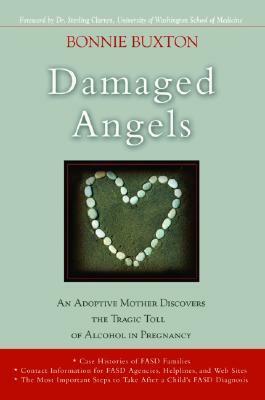 Its main theme was the grief drinking causes in the unborn child, and society's denial of that preventable damage, but also offered some helpful advice for those who choose to raise those damaged, and challenging angels. A book about prenatal alcohol exposure. Very very interesting read. Also a very sad read. The author is the mother of daughter with FAE and she writes about her struggles as well as the struggles of other parents and their children and what could be done about it. Very informative Canadian resource. Statistics were well presented. Author does not sugar coat FASD, so be prepared for the cold harsh truth. Excellent insight and factual information. You would have thought she was writing about my daughter. Opened my eyes and gave me peace in that 'this is my life with my fas daughter'!